Sikkim Chief Minister Pawan Chamling was on Sunday felicitated by the Gorkhaland Territorial Administration (GTA), Darjeeling for his record in Indian politics of being elected the Chief Minister continuously for five terms. He was hailed as the ‘Pride of Indian Nepalis’ by the GTA. 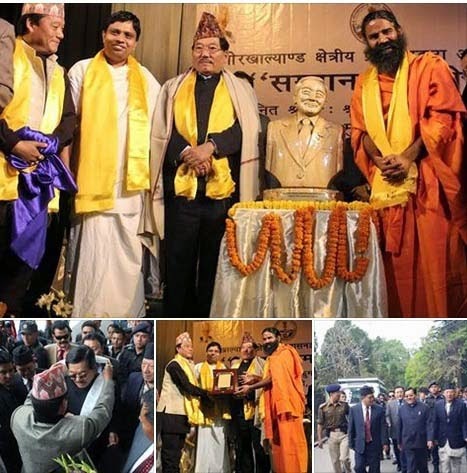 GTA chief executive Bimal Gurung presented with a citation, shawl and a wooden bust of him in presence of yoga guru Baba Ramdev during the function at Gorkha Ranga Mancha Bhavan, Darjeeling. The Sikkim Chief Minister said he and people of Sikkim supports the Gorkhaland demand. “The demand of Gorkhaland is within the framework of the constitution and what is there in the constitution we have the right to ask. For the demand of Gorkhaland all should unite and fight and make the central government believe that it is a united demand. This type of situation should be brought in Darjeeling,” he said. Chamling pointed out that the Sikkim Legislative Assembly had passed a resolution supporting the Gorkhaland demand which was sent to the Union government. “You all should stand with the demand of Gorkhaland and be consistent about it. Sikkim and the people of Sikkim are with you,” Chamling said. Sikkim Chief Minister Pawan Chamling was on Sunday felicitated by the Gorkhaland Territorial Administration (GTA), Darjeeling for his record in Indian politics of being elected the Chief Minister continuously for five terms.